Leslie Chow has escaped from prison. The Wolfpack is headed to rehab. A Russian military convoy has been hijacked. And Mary Katherine visits her father Professor Bomba. In this, the final third of the sixth chapter of the collision of the Hangover and Fast & Furious franchises, the creators of Ice Age take you on a journey the likes of which you have never seen before. Dominic Toretto is brought in by the Diplomatic Security Service to track down and capture his believed to be dead ex-girlfriend, Letty, who has absconded with Leslie Chow, $21 million in gold and a large supply of Russian ordinance. As Dominic gathers his crew who have retired around the world in exotic locales, he learns of the involvement of Chow and that he must now enlist Alan of the Wolfpack. Meanwhile, Professor Bomba studies artifacts he believes are used in a long secret war fought by tiny beings who protect the forest. Letty and Chow have concocted a plan, utilizing the gold and the guns, they plan to take the ancient artifacts for their magical properties. All of the forces converge on Bomba’s home, but Alan unleashes a special mixture of GHB and Ecstasy on the whole lot of them and surrounded by the artifacts, all of them are shrunk and dumped into the world of the Leafmen and the Boggans, directly into the struggle that has lasted for centuries. Will Dominic learn what happened to Letty? 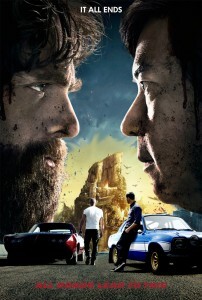 Will Chow be punished for his crimes? Will Mary Katherine and Professor Bomba’s dog Ozzie unlock the secrets of the artifacts before it is too late? The fate of the world rests on the shoulders of four men who can’t remember last night and a whole bunch of muscle cars. Discover a world beyond your imagination. All roads lead to this. It all ends.